Mr. Kaepernick, Nike, NFLPA and Their Shoddy Deals! You are here: Home / Money / Business / Mr. Kaepernick, Nike, NFLPA and Their Shoddy Deals! Mr. Kaepernick and the National Football League Players Association (NFLPA) appear to be hijacking, a black movement whose vested interest is; to STOP THE KILLINGS. Kaepernick is now GETTING PAID by NIKE. The NFL owners have offered the NATIONAL FOOTBALL LEAGUE PLAYERS ASSOCIATION (NFLPA) $90,000,000.00 to stop the kneeling. All this money is sloshing around into the pockets of NFL players, without a SINGLE DOLLAR BEING DEDICATED to REAL SOLUTIONS TO STOP THE KILLINGS. There are some real solutions being put forth, but those solutions need money to make them happen. Money that is being hijacked by these brothers, without any regard to supporting those REAL solutions ( http://thyblackman.com/2018/05/29/its-not-about-the-kneeling-its-about-stopping-the-killings/ ). IT’S A DAMN SHAME BEFORE, NOT JUST BLACKS, BUT BEFORE THE HUMAN RACE THAT THESE PEOPLE THINK SO LITTLE OF BLACK LIVES. It is, as if they are saying black lives “do not” matter, as the killings continue unabated, due to a lack of money being funneled into solutions. Here is the bottom line and it should be the bottom line of any one who has a vested interest in seeing the killings stopped. IF NO BLACKS WERE BEING ABUSED AND GUNNED DOWN BY ERRANT POLICE OFFICERS and their proxies – NO ONE, INCLUDING MR. KAEPERNICK, NIKE AND NFLPA WOULD BE GETTING PAID. Nike, a fortune 500 corporation, whose stock is traded on the New York Stock Exchange under the ticker symbol NKE, is now using the killings of African Americans, to sell sneakers and make hundreds of millions of dollars, which will enhance the lives of the wealthy and billionaires. Many of whom are Republicans and President Trump supporters. Nike is essentially, making a profit off the backs of our dead brothers and sisters! And that’s a bitter pill to swallow. This corporation is making no monetary effort, whatsoever to contribute to solutions, when it comes to the killings. Remember, the deaths of Trayvon Martin, Michael Brown Jr., Tamir Rice, Eric Garner, Sandra Bland, Ezell Ford, Philando Castile, Alton Sterling, LaQuan McDonald and others killed by errant police officers. Had they not died at the hands of errant police officers and their proxies, there would be no “JUST DO IT CAMPAIGN” for Mr. Kaepernick. We have a problem folks, Black Americans are being gunned down and not a SINGLE DOLLAR IS BEING DEDICATED to REAL SOLUTIONS TO STOP THE KILLINGS. All this money being made on the backs of dead black folk, who continue to be killed by errant police officers, who based on Kaepernick’s statement are also, “… getting paid leave and getting away with murder. …” Where is the integrity in these shoddy arrangements? How can these players honestly call themselves, men? Nike could set aside $50,000,000.00 to sponsor a meeting of stakeholders to address solutions, when it comes to these killings. 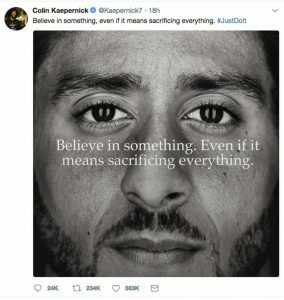 I tweeted Kaepernick, Nike and the National Football League Players Association (NFLPA) about my position and the “Just Do It” campaign commercials to sell Nike sneakers. Will my tweets go unnoticed? Probably. But hundreds of tweets, with the same message will not!! Now, HERE is your chance to do something. You all do have an interest in stopping the killings…don’t you? Then JUST DO IT! Now, it’s your turn. Where are your tweets to let these people know we aren’t going to allow them to get away with this! Congratulations on your “Just Do It” campaign. However, what about solutions to stop the killings? (link:http://thyblackman.com/2018/05/29/its-not-about-the-kneeling-its-about-stopping-the-killings/ )… Everyone, including you, is getting paid, but the killings continue unabated. Solutions, we need solutions! (link:http://thyblackman.com/2018/05/29/its-not-about-the-kneeling-its-about-stopping-the-killings/ ) … Everyone, is getting paid, but the killings continue unabated. Solutions, Black America needs solutions! Mr. Davis is a leading expert and consultant in Financial Analysis and Social Dynamics. He is a graduate of Florida A. and M. University(FAMU), a former stockbroker, and a human rights activist who resides in Sanford, Florida. He was awarded the prestigious Governor Haydon Burns Scholarship to attend FAMU and while at FAMU was awarded the first Martin Luther King Scholarship. He is the author of three books, among them is “The Fix This Time,” Boost Your Retirement Income! Simultaneously Create Jobs and Spur Consumer Demand (https://www.amazon.com/dp/B00MI3PD2M). He can be reached through his blog @, (http://www.thefixthistime.com). There is nothing wrong with my facts. Be specific! Blacks continue to die at two and one half times the rate of whites in whim killings of African Americans. Black America procrastinates in demanding a stakeholders meeting to address and vet solutions. In the meantime Nike, is making hundreds of millions of dollars on increased sneakers sales because of the killings and NFLPA having been offered $90,000,000.00 by NFL owners for Civil Rights issues surrounding the killings of African Americans stall in their response. What, I ask you is morally wrong with this picture? I would hope someone would be more accurate (or, at least, put a little context with this opinionated post), since I (want to) believe their passion for the cause is genuine. Hey, I got an idea! See What you think! First though, Remember, the deaths of Trayvon Martin, Michael Brown Jr., Tamir Rice, Eric Garner, Sandra Bland, Ezell Ford, Philando Castile, Alton Sterling, LaQuan McDonald and others killed by errant police officers. Had they not died at the hands of errant police officers and their proxies, there would be no “JUST DO IT CAMPAIGN” for Mr. Kaepernick. Now here is my idea! Do you think, if we can increase the rate of the killings of African Americans from two and one half the rate of whites to say five times the rate, we can help Nike and NFLPA make more money, and more money! Or, you think we should do what sane people would do, and hold Nike, and NFLPA accountable and demand they monetarily contribute to solutions to help stop the killings? Nike sales surged 31 percent … Interesting!